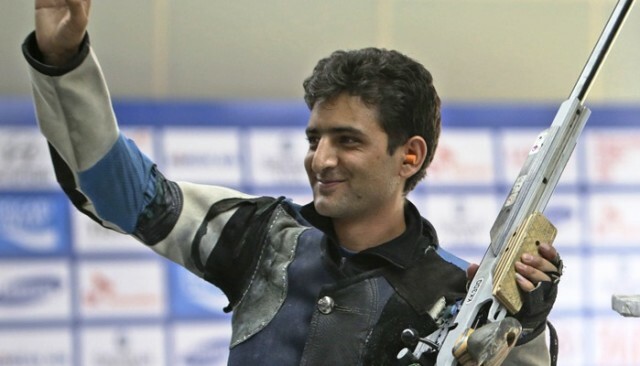 Chain Singh won an Olympic quota for the 2016 Rio Olympics after finishing eighth in Men’s 50m Rifle Three Positions at the ISSF World Cup in Gabala, Azerbaijan. The 26-year-old Army shooter is the seventh Indian shooter to win an Olympic berth for Rio Olympics next year. Chain qualified for the finals after shooting a qualification score of 1174 (395 in Kneeling, 396 in Prone and 383 in Standing). However Chain was the first to be eliminated after shooting 403.7 in the finals. Nevertheless, an eight place finish was good enough for the quota place. China’s Hui Zicheng won the gold in this event. Alexander Schmirl of Austria won the silver while China’s star shooter Zhu Qinan won the bronze. Chain has proved his mettle as a multi-event shooter in the recent international shooting competitions. He had previously won a bronze medal in the same event at the 2014 Asian Games in Incheon. He had also won a gold in 10m Air Rifle at the Asian Shooting Championship 2014 in Kuwait. In the ISSF World Cup in Changwon this year, Chain had finished 6th in the 50m Rifle Prone.